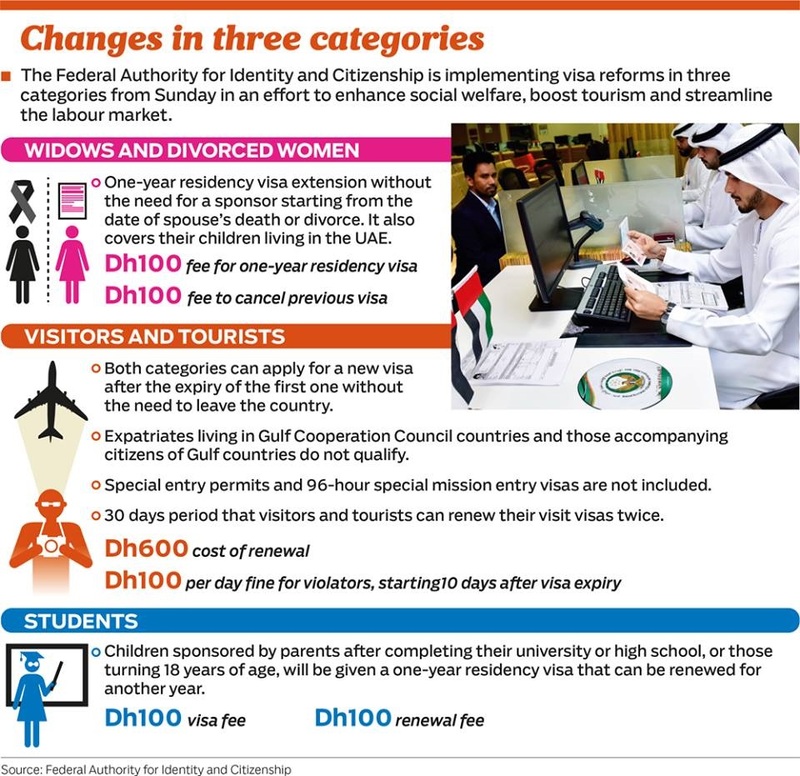 The Federal Authority for Identity and Citizenship has announced new UAE visa rules and updates to roll out from October 21 including 3 new changes which will benefit UAE Families, Residents and Visitors (Tourists/Job seekers). 1. Granting a visit visa extension (for 2 times, 30 days each) for visitors and tourists without having to leave the country. 2. A 2-year extension of the residency period (one-year at a time) for students, dependent of their parents after grade 12 and those who have finished their university studies. 3. Granting 1-year extension of residency visa for widows and divorced women and their children. The most appreciated reform by Government is the extension of visit visa for 2 times (total of 60 days) which will help job seekers to save money and time while searching for a job in UAE. Previously, visit visa holders (visit or tourist visa) especially job-seekers, had to leave the UAE after the expiration of their 3 months visit visa or 1-month tourist visa and then applied for new visas and air ticket, to return to the UAE for job hunting. All arrangements for the new visa reforms have been put in place, people who are looking to benefit can go to Tasheel centres or the Immigration offices (Federal Authority of Identity and Citizenship) across the country and apply for the visas from 21 October 2018. Those who wish to extend their visit or tourist visas will extend it through their travel agents that applied for the original visas. People wanting to extend their visit or tourist visa’s will need to pay 600 AED for each of the 30 additional days (1 Month). As per latest rules, starting 21st October, the visit and tourist visa holders can extend their visas for second time for more 30 days at a same fee of 600 AED. Point to be noted that 3 months visit, or 1-month tourist visa can only be extended twice, 30 days for each extension and after that the person must leave the country or face fines which is now 200 AED for the first day and 100 AED from the second day of overstay. Fees to renew residency visa for Widows, divorced women and students is 100 AED for 1 Year. So, after above great news, people who already have 3 months visit visa and are looking to extend visit visa can now live up-to 5-months in UAE by extending it twice without bearing travel (in-out/re-entry) expenses. we are very happy with UAE goverment they took very good decsion. Yes, it is very good decision after Amnesty 2018. My visit visa expired 40 days..beacuse my company apply my working visa have a problem what is the best solution to me? 40 Days visa can extend for 20 days for the first time, and 30 days for the second time, contact the travel agent who issued your visa. Horray! That is great decision ever made! More power UAE!!!. This is really a great news. Thanks to UAE government. I hope that you will also allow the visitors and tourists to have health insurance while staying here in UAE. It is under process, foreign people who wish to enter UAE on 6 months Visa will soon get Health Insurance. After 5 months, after how many days gap can a person re-enter UAE? You can re-enter UAE once you exit the country, there is no fix time, Immigration will check exit in system in-order to issue new visit visa to you, it can be withing 1 week. No, if you have applied for amnesty and taken 6 months temporary visa, you will have to find job within 6 months, in case you failed, you will have to leave the country, UAE 6 Months visa is not renewable. I am holding a 3 months visit visa right now and is about to expire on 26 Oct. 2018. I talked to my travel agent and she told me that my visa is not illegible for this new visa extension rules. Please advise. I am holding a 3 months visit visa right now and will expire on 26 Oct. 2018. I talked to my travel agent and she told me that my visa is not illegible for the new visit visa extension rules and can't be extended. Please advise the soonest on what to do. 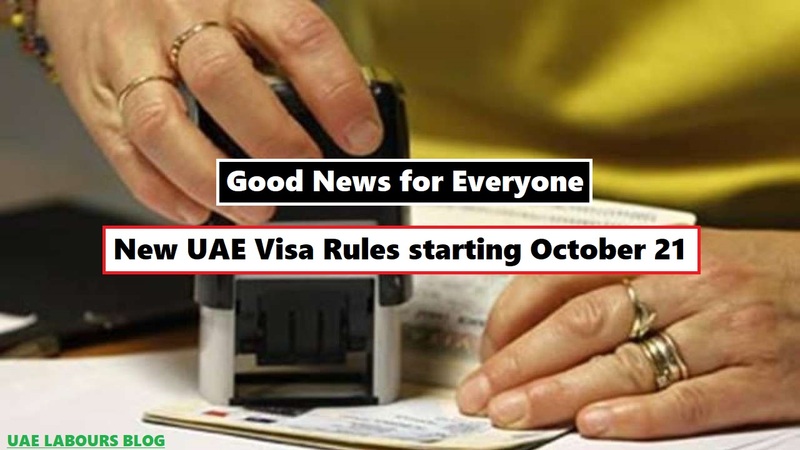 As per officials, UAE New Visa Rules related to extension is started from 21 October, so people who are getting visas from 21 October can extend their visas. Can a wife under husbands visa can sponsor her family for a family visa here in Abu Dhabi? Married Couples (Husband, wife) can sponsor each other for UAE residence visa. If you are working or Living in any state of UAE and you have a valid employment visa or businessman visa, you can apply for residency visa for your family, including your spouse and children. if people re enter UAE ILLEGALY THAN GOES HOME COUNTRY they can re enter UAE again using visit visa or no sir? No, if they have life time ban or blacklist as per current law and rules, don't know if in future government allow people to clear their names from blacklist. sir..my 3 months visit visa is expiring on 2/11/2018..so my travel agent is saying that i need to exit the country to get new visit visa for another month..he is saying that i left only 1 week remaining in my visa so i cannot renew it as per the new extension policy...please suggest me sir what should i do..!! Visa's which issued after 21 October are only eligible of extension, you must leave UAE before the expiry of your visit visa. Can we renew 6months Amnesty Visa? No, you have to exit from the country once your 6 months temporary job seeker visa get expired, this 6 months uae visa is not renewable. 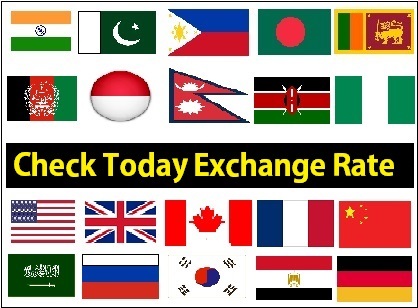 Thank You for your comments, keep visiting us for more valuable updates. hi i have a cancelled residence visa that expires 20 December is it possible to get a 6 months visa or I have to apply for a new visit visa. currently is there any restriction to renew 3 month visit visa for 2 month...my visa starts from 20.jan.2019. Hi. How can i avail of the extension for my family who's going to visit here? I called an agent and she said the fee is 1000dhs and not 600dhs.my mum is coming over on a 90 day visa and we would have to extend her for another month. Highly Appreciate your blog, all the information about dubai visa, helpful resource for expats.